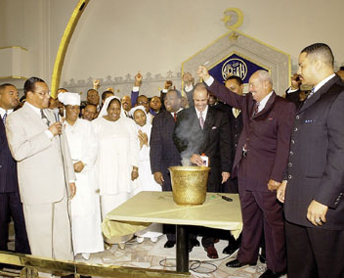 CHICAGO (FinalCall.com) - As the flames flickered inside a gold bowl during a momentous mortgage burning ceremony April 11 Easter Sunday at Mosque Maryam, a debt-free Nation of Islam arose from the ashes of the papers that burned. With donations from Muslims, followers and supporters to the national charity given this year as a Saviours’ Day Gift, the Honorable Minister Louis Farrakhan paid off the remaining mortgage balances on farmland in Georgia, the National House, which serves as the Chicago home of the leader of the Nation of Islam (NOI), and the National Center in Chicago, which consists of Mosque Maryam and Muhammad University of Islam. "We’re trying to get back the things that poor Muslims pooled their dollars to get when the Honorable Elijah Muhammad was here," Minister Farrakhan explained. "Here’s a man that took our nickels, dimes and dollars; we had 5,000 acres of land in Georgia; 10,000 acres of land in Alabama; 20,000 acres in Honduras. We had airplanes, trucks, schools, international trade and commerce, ships bringing our products from all over the world. The Honorable Elijah Muhammad was not interested in building a church. He said that we are a nation of people and a nation has to have earth in order to be independent." 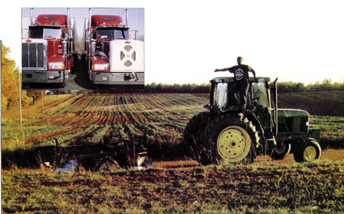 Nation of Islamfarmland in Georgia and Peterbuilt trucks (inset). Minister Farrakhan officiated the ceremony as a preface to his Easter Sunday address which was delivered live via webcast to all of the NOI mosques and study groups. The audience shouted "Burn, baby, burn!" and "Debt free!" echoing Minister Farrakhan, as brothers and sisters raised their fists of triumph in the air, while others hugged and tried their best to hold back tears. "The brothers are hugging each other because they know what we went through to get to this day. What the general public does not know is how the FBI and the National Security Agency of the United States Government send people in among us, to get into positions so that they can rob the nation and create havoc inside the Nation," The Minister told the audience. "We know the White man, we know his evil, but we have overcome to this point." On the rostrum, he was surrounded by NOI national officials and regional ministers. During his remarks, he distinguished the labor and honesty of the First Lady of the Nation of Islam, Mother Khadijah Farrakhan, who was standing beside him, for she once served as the first secretary of the Nation of Islam under his leadership of the rebuilding process which began in the basement of their home in 1977. From there, Minister Farrakhan continued to explain, the Nation held meetings in rented rooms, and eventually purchased The Final Call Administration Building, a former bank and a funeral parlor, which was dedicated in 1982. The down payment on the building was paid out of honoraria Minister Farrakhan received from his numerous speaking engagements at colleges. Out of his own pocket, he furnished, restored and equipped the building, asking Muslims only to buy a chair, because, he shared, "I wanted you all to know that I was not a robber." He never put his name on any of the properties; they all belong to the Nation of Islam. Through all of his rebuilding efforts, he kept his eyes on the former headquarters of the Nation of Islam, the National Center. 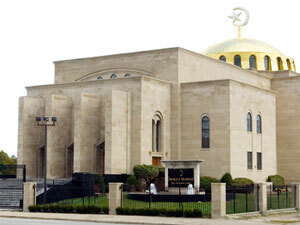 Mosque Maryam, originally built by the Greek Orthodox Church, was first purchased by the Honorable Elijah Muhammad and the Nation of Islam in 1972. However, when the Nation fell in 1975, the property was eventually abandoned, although ownership was retained by Imam Warithudeen Mohammed, son of the Honorable Elijah Muhammad and his organization at the time, the World Community of Al-Islam. "You couldn’t replace this building today for $10 million, if you understood the material that went into the building; they don’t build them like this anymore," the Muslim leader noted, pointing to the gold that adorns the arches in the mosque’s sanctuary. 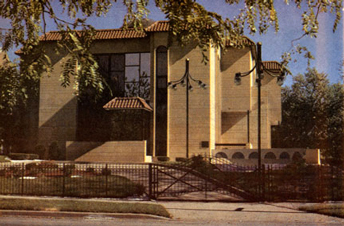 In 1988, the properties of the National Center were repurchased after four months of sacrifice and fundraising by the Muslims and NOI supporters. In order for individuals to save their money and local mosques to increase their revenue, for the past two years, Muslims were asked to hold local events recognizing Saviours’ Day, the NOI’s annual celebration of Master Fard Muhammad, the Founder of the Nation of Islam Whom the Nation recognizes as the Mahdi of the Muslim world. Prior to this request, the entire Nation of Islam would converge in one city to celebrate Saviours’ Day. This year, many mosques overwhelmingly exceeded their goals for the Saviours’ Day Gift charity, an effort from which Minister Farrakhan encouraged audience members to take an example. "All of you who struggle, sometimes you move out on faith and if you really believe in what you’re doing, God will assist you. Never be afraid to step out on faith if you really want something," he said. This two-year sacrifice and hard work enabled Minister Farrakhan to keep his promise of removing the burden of debt on the Nation. "I didn’t give you back 10 percent. I have given you back nearly 50 percent of what you gave me, and I’m not done giving back yet because we have economic development in front of us," he informed his rejoicing listeners. Doing for self is the basis of the economic program of the Nation of Islam. The Honorable Elijah Muhammad established the Three Year Economic Savings Program in 1964, which called for Black people to pool their resources by contributing $10 a month to purchase farmland and establish manufacturing mechanisms to help feed and clothe themselves. Minister Farrakhan re-established this program in 1991, and three years later, the Nation of Islam purchased 1,600 acres of land in Georgia—which is now also debt-free to the dismay and rage of bankers, who were upset that the debt had been paid because it cuts into their profits, a greed that Minister Farrakhan said the Holy Qur’an describes as usury. "One of the worst things that could happen to an individual is to get in debt and not be able to manage it. The enemy is always desirous of getting you into debt and he fascinates you with things that titillate your fancies. Because we live in the richest nation in the world, we are fascinated by the wealth of our enemies," he said. "What they don’t tell you when they sign the paper is that there is a hope that you won’t be able to pay it, so that they can take advantage of a bad time that you and I may have as an individual." That hope of the banking industry has now been obliterated. However, hope for an independent future was high among the Muslims. "Right now, our mouths are in the White man’s kitchen, and if he does not feed us, we are unable to feed ourselves. This is a dependent condition. Now, we can build economic development. We need several million acres of land to feed our people," Minister Farrakhan stressed in his concluding of the ceremony. "We have to build a nation and stop begging the White man to do for us what we can unite and do for ourselves."